Ramona's Voices: Mitch McConnell Tells a Big Fat Lie. Or Two. Today, a little more than a month after Supreme Court justice Antonin Scalia died suddenly while hunting at a Texas ranch, President Obama announced his choice for a replacement. He has chosen Merrick Garland, a D.C Circuit judge well known by most Beltway pols, almost unanimously endorsed by both Republicans and Democrats during previous nominations, a man whose views range from moderate to conservative, appealing to all but the most liberal among us. This choice by Obama was, by all accounts, deliberate. Republicans are on record singing Garland's praises. They go way back, these guys. Good man! If anyone could get through the gawdawful GOP gantlet this most brilliant choice for SCOTUS would be it. It was as if Mitch McConnell had been talking to brick walls! The day after Justice Scalia died, mere minutes after taking off his sad face, the Senate Majority Leader wasted no time making one thing crystal clear: This particular sitting president has no right appointing anyone to the Supreme Court during a presidential election year. It should be the right of the people, McConnell said, and the right of the people doesn't start until January, 2017, when a new president not named Obama will be sworn into office. 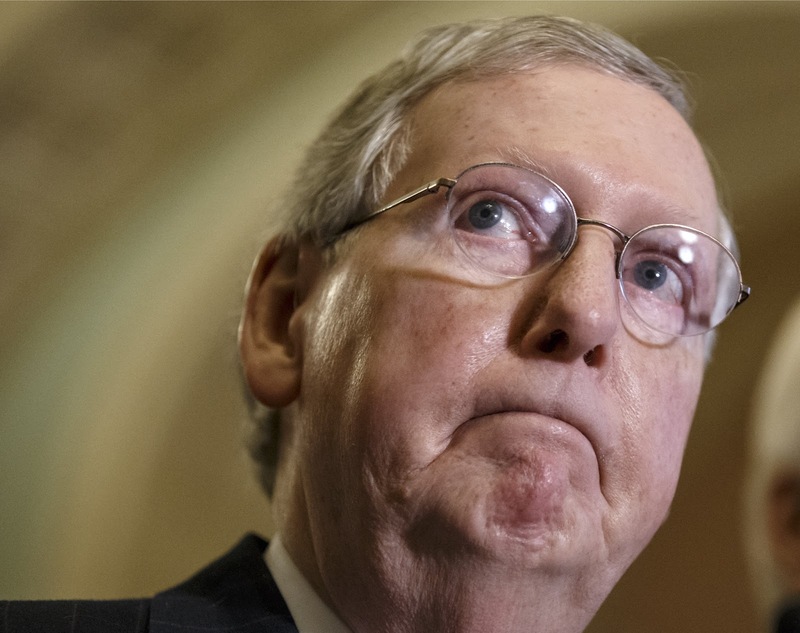 Well, some people--even people who knew Mitch McConnell--were stunned! What? What did he say? He said President Obama could nominate up the wazoo but even Jesus Christ almighty wouldn't go up for a vote. (Not his exact words.) He would never allow a vote on any nominee put out there by Barack Obama. Period. End of story. That was in February. Today President Obama broke the news to Mitch McConnell that he, Barack Obama, president of these United States has the right to nominate anyone of his choice and the Congress of the United States had both the right and the obligation to vote on his choice. At a time when our politics are so polarized, at a time when norms and customs of political rhetoric and courtesy and comity are so often treated like they are disposable, this is precisely the time when we should play it straight and treat the process of appointing a Supreme Court justice with the seriousness and care it deserves because our Supreme Court really is unique. It's supposed to be above politics. It has to be. And it should stay that way. To suggest that someone as qualified and respected as Merrick Garland doesn't even deserve a hearing, let alone an up or down vote, to join an institution as important as our Supreme Court, when two- thirds of Americans believe otherwise, that would be unprecedented. To suggest that someone who has served his country with honor and dignity, with a distinguished track record of delivering justice for the American people might be treated, as one Republican leader stated, as a political pinata. That can't be right. McConnell, that old constitutional scholar, brought up a previously unknown argument for his side known only by McConnell as "The Biden Rule". According to McConnell, Joe Biden once said that a president shouldn't be able to nominate a supreme court justice during his final year in office. There is no Biden Rule and Joe Biden never said what McConnell says he said. In fact, Igor Volsky made that clear in a ThinkProgress article published right after McConnell made that claim, citing a partial clip of Biden's speech C-Span had put up on their website . But Biden's full speech undermines their claim. Rather than urging his colleagues to deny Bush's potential nominee a hearing, Biden was bemoaning the politicization of the confirmation process -- hence his suggestion of not holding a hearing in the heat of a presidential election -- and what he saw as Bush's refusal to properly consult with the Senate in selecting a nominee. In fact, just 10 minutes after calling for temporary inaction on Bush's candidate, Biden actually promised to consider a moderate Supreme Court nominee. Joe Biden's office has released the following statement: "Nearly a quarter century ago, in June 1992, I gave a lengthy speech on the Senate floor about a hypothetical vacancy on the Supreme Court. Some critics say that one excerpt of my speech is evidence that I oppose filling a Supreme Court vacancy in an election year. This is not an accurate description of my views on the subject. Indeed, as I conclude in the same statement critics are pointing to today, urged the Senate and White House to work together to overcome partisan differences to ensure the Court functions as the Founding Fathers intended. That remains my position today." But just today, some three weeks later, Mitch McConnell used that same already disputed Biden claim as reason not to consider President Obama's nominee. McConnell knows he's lying. He has to know that WE know he's lying. But, true to form, he doesn't care. So now we wait to see who does care. And what will happen in November if they don't.